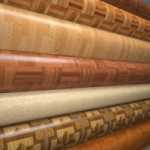 Carpet tiles are ideal for most commercial environments. They’re extremely hardwearing and long lasting, making them perfect for areas that receive a lot of foot traffic, such as a busy working office. Not only this, they’re also relatively easy to fit yourself, as long as you follow a guide. So Brent Carpets’ have created their very own guide for how to easily fit carpet tiles to give you a helping hand! The first thing you should do is make sure the subfloor is ready for the new carpet that is about to be laid. This involves removing any old floor coverings and adhesive so that you have a blank canvas to begin working on. Following this, clean the whole of the floor surface by either vacuuming or sweeping any dust or debris. If your carpet tiles are being laid over floorboard, make sure you lay hardboard down first; smooth side up. If the wooden floorboards have been treated with wood preservatives then it’s not suitable to be used as a subfloor – even with the overlay. If working with concrete flooring, make sure it is smooth and dry. There should also be a damp-proof membrane. If the concrete floor is new, it could take up to 6 months to thoroughly dry out. Allow enough time for this before laying the new flooring down. Now for the maths part! Carefully follow our step-by-step instructions to find out how many carpet tiles you will need for the job. Multiply the width of the room by the length of the room. Subtract the area of any bay windows, alcoves, chimney breasts etc. Once you have a figure, divide it by the area of one individual carpet tile. Add 10% to this number and you should have the grand total for the number of carpet tiles you need to buy. Top tip: make sure all your tiles have the same batch number! For tiles that are NOT self-adhesive, you must follow the manufacturers instructions and guidance on which adhesive to use and how to apply it. It is possible to attach the tiles in place using double-sided tape or a low tack adhesive. This is particularly handy if you plan on replacing them at some point, as it will make removing them far more easier. Top tip: Leave all electrical connections and plumbing clear and uncovered. Make a line with chalk down the middle of the room. Then draw a second line at a 90 degree angle to the first line. Loosely lay the tiles down on the ground along the lines. This will give you an idea of how the tiles will appear when fitted. If you end up with narrow strips that don’t fit well around the sides of the room, re-draw the chalk lines. Once you are happy the lines are in the right places, start laying the tiles in rows (without the adhesive for now) along the chalk lines, beginning in the middle. Cut the border tiles to size. Try to avoid moving the tiles around as this will cause the adhesive to clog in the joints and will make for a bad fit. Wipe away any excess adhesive with a damp cloth as soon as you see it appear. So now you’ve read our handy guide to fitting carpet tiles, you can go ahead and have a go at doing it yourself! Just remember to follow our steps closely and, if you get stuck, it’s always best to call in the professional carpet fitters. Here at Brent Carpets, we supply carpet tiles as well as offering an expert fitting service, so you end up with not only a fantastic quality carpet but a perfectly fitted one too! Our tiles can be cut to any shape or size, so you can rest assured in knowing that they will fit your room. 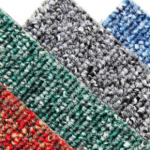 For more information on our carpet tile range, please give us a call today.